Jordan’s background in events a nd decorating partnered with his modern, upscale design aesthetic are a natural fit at Event Floral. With a bachelors in Marketing and Public Relations, Jordan has experience in non-profit, corporate, political, and special events in Milwaukee, Rockford, and most notably, Washington D.C., as a member of Mrs. Obama’s social staff. Jordan keeps current with trends and enjoys infusing designs with reimagined traditional elements. Jordan manages the studio, overseeing staff, scheduling, production and day to day operations. 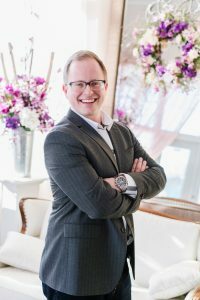 He designs bridal and retail floral and also leads event set ups, designing custom, on-site floral and décor installations. He celebrates his love and near obsession with Christmas by designing and installing holiday décor for numerous homes, offices, and previously even the White House three years in a row. Named “Top 35 under 35” by Florists’ Review Magazine, August 2017.